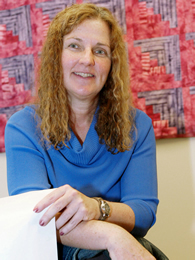 Susan Allen, MD, MPH, has worked to combat the AIDS epidemic in Africa for more than 25 years. As researchers and policy makers work toward an effective HIV vaccine in a constrained global economy, cost-effective prevention strategies such as Couples Voluntary Counseling and Testing (CVCT) must take a larger role in efforts to decrease the rates of HIV/AIDS in Africa, says Emory University HIV/AIDS vaccine researcher Susan Allen, MD, MPH. Allen presented her research today at the AIDS Vaccine 2010 international conference in Atlanta, sponsored by the Global HIV Vaccine Enterprise and locally hosted by the Emory Center for AIDS Research. Allen, who has worked to combat the AIDS epidemic in Africa for more than 25 years, highlighted the value of CVCT and other cost-effective HIV prevention strategies. Allen, founder of the Rwanda Zambia HIV Research Group (RZHRG), notes that the positive impact of CVCT has been supported by published evidence since the early 1990s, yet the program has not yet been implemented on a wide scale. Of more than 30 million Africans tested for HIV, less than one percent has been tested with their spouses, says Allen. “Funding agencies are only now beginning to understand and appreciate the value of CVCT as part of a broader HIV/AIDS strategy,” Allen says. An estimated 23 million Africans are HIV positive, yet only 3 million are receiving antiretroviral treatment (ARVT). The World Health Organization calculates that for every two new ARVT patients, five new HIV infections occur. The U.S. government spends approximately $2.2 billion – 10 percent of the entire U.S. bilateral foreign assistance budget – on antiretroviral treatment. Treating one ARVT patient for 10 years costs about $7,000. In comparison, providing couples with voluntary counseling and testing would prevent new HIV infections at a cost of about $300 each, and would leverage other vital programs such as family planning, Allen says. As the population steadily increases, Allen says, funding agencies will face even more pressure to use their funds wisely. Video: "HIV/AIDS Research at Emory University"
Video: "Emory Hosts AIDS Vaccine 2010"
News: "International AIDS Vaccine 2010 Conference Meets in Atlanta This Week"